One of the things I love about polymer clay is it's versatility. You can mix any colour you want, add surface patterns and textures, cut shapes and create all sorts of 3D forms to make any design you like! So, one month on from my last blog, have I actually made my fabrics up into anything? Firstly, the deep lavender crepe has indeed been made up into the Vogue tunic by Rebecca Taylor. As this top is a simple, clean shape, I decided to go for a striking necklace to put with it, using my Sparkle technique. Starting with a purple base clay, I added a sheet of silver foil and some pink, gold, purple and red alcohol inks to create a random pattern of colours. The beads were cut using a petal shape cutter and I made some little spacers to go between the larger focals. The final necklace has a soft purple faux suede cord and sits just on the yoke of the tunic. 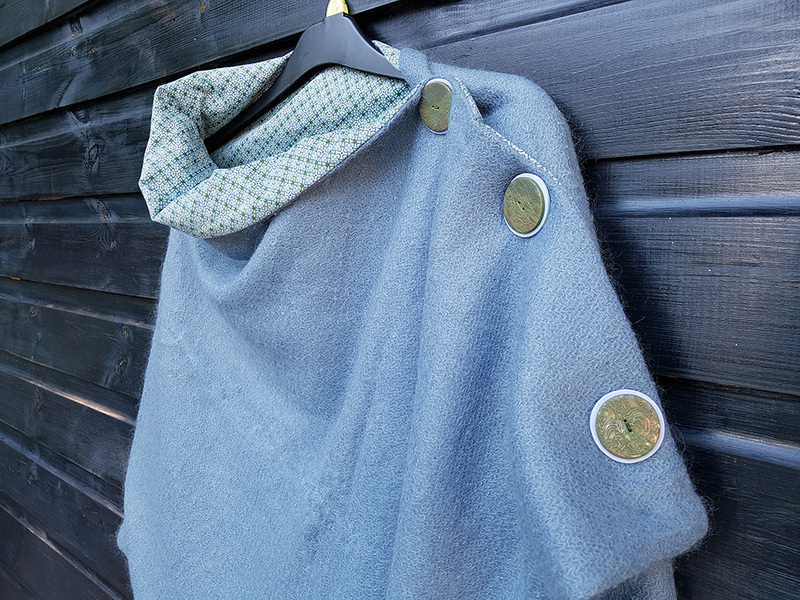 I've also made up the deep purple wool and powder blue mohair into Coolcrafting's Skye Tweed Wraps. This is such an easy pattern to make up and the wool drapes beautifully. The mohair was a bit more of a challenge however, as I didn't want the lining to show through its open weave. Fortunately, I had enough fabric to use it double thickness and I teamed it with a soft pinstripe cord lining in blue, white and olive to help hold the mohair in shape. The purple wrap features buttons using what's called a Klimt pattern. I mixed cream, burgundy, navy and pale blue clays to create the 'cane' from which I made a veneer and cut out the buttons. I sat the upper design on a purple ground to give three striking spots of colour on the garment. I wanted something a bit softer to sit on the mohair and after several false starts, came up with this design which gives a good contrast to the wool without being too 'loud'. The mix of metallic green, blue and bronze mica powders on the textured surface catch the light when the fabric moves, see detail above. The wraps were such fun to make that I made two more. The first uses a geometric grey wool which I lined with a tiny grey and white print cotton. I decided to go for a more organic style button this time, as this fabric is such a strong design. After some experimenting, I came up with a set of 'pebbles' which are all different, hand formed and stitched on a diagonal down the shoulder seam. The last wrap to be completed uses a brown and red tartan wool. The flecks of colour in this are gorgeous and I wanted to try and complement the colours in the buttons but let the fabric carry the interest. 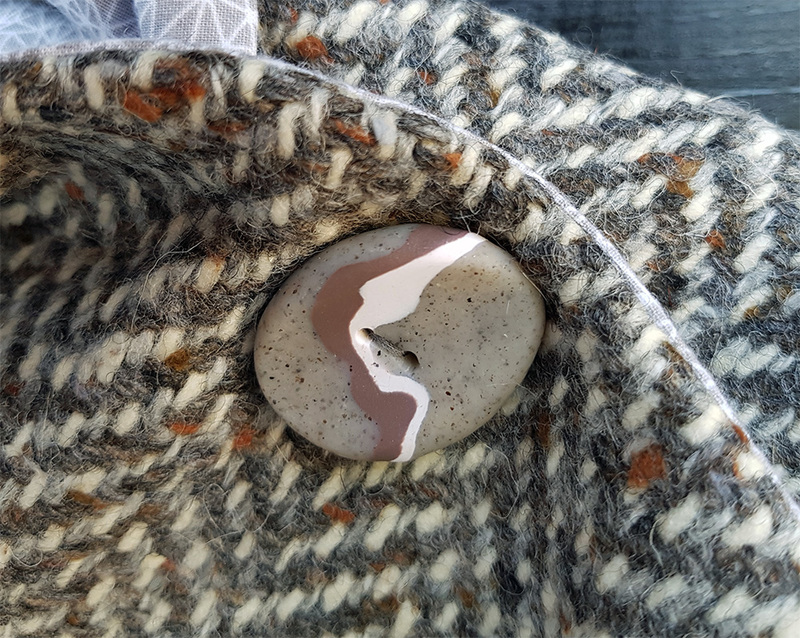 I made three large round buttons for this wrap and took inspiration from the design of the fabric to take into the texture of the buttons, which also feature a gentle bowl shape. I added some red and gold paint to enhance the buttons' surface and added a gold edge to give contrast. I hope you like them! All the garments and lots more buttons will be on my stand, C18 at The Creative Craft Show in Exeter at the end of the month. Early bird tickets are still available here. If you'd like to come and spend the day learning to make your own Buttons or Sparkle Beads, follow the links to find out more! Have Oyster Card, will travel!